Re-reading the Fantastic Four comics from the start. In annual #4, the FF meets a familiar face from Marvel’s pre-history. What’s “pre-history,” you wonder? 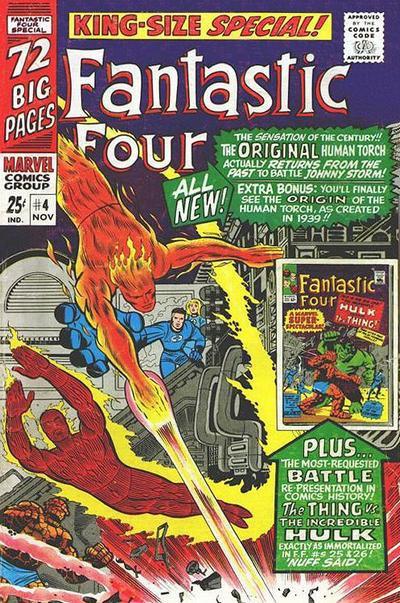 That’s when Marvel references the grey area in its history, mentioning stories published before the Marvel Universe officially “started” with the publication of Fantastic Four #1. Confused? Don’t be, let’s just read the comic. The fun begins at the Baxter Building, where Reed, Sue and Johnny are answering the FF’s fan mail. One letter asks about the original human torch, and Reed informs Ben that there was another man calling himself “Human Torch” 20 years earlier. Mail time is interrupted by a burst of energy. The Inhumans’ giant teleporting dog, Lockjaw, appears. He’s brought Johnny and Wyatt Wingfoot with him. Remember that in the last couple of issues, Johnny and Wyatt found the big dog while searching for a way to rescue the Inhumans from their city, imprisoned under a huge dome. Lockjaw’s been trained to keep people away from the dome, which is why he’s sent Johnny back to the Baxter Building. Johnny is despondent again over being separated from his lady love, Crystal, who trapped with the rest of Inhumans. Reed tries to feed some milk to Lockjaw, only to have Lockjaw drink too fast and zap everyone with a bolt of electric energy. We cut from there to some secret lair of an old FF foe, the Thinker (still not called the “Mad Thinker” except for the hyperbolic splash page). He has a man in glass cage. The Thinker, whose deal is making deadly androids, says that this man is the first android ever created, and that he’s been searching for him for a long time. The android flashes back to 20 years earlier, when he was created by a Professor Horton. 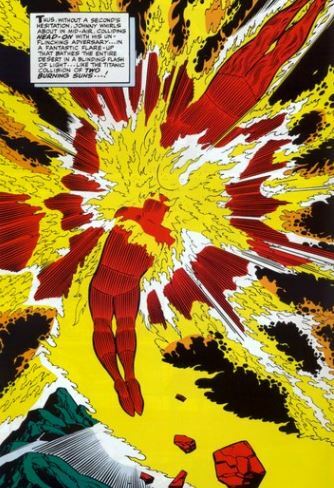 He was dubbed the “Human Torch” because of his fiery powers. Fearing his creation was dangerous, Horton tried to destroy the Torch, but the android escaped. Back in the present, the Thinker says he’s given the Torch control over his powers, so he no longer bursts into flame by merely being exposed to oxygen. The Thinker then threatens to destroy the Torch if the Torch does not obey him. Back with our heroes, Johnny leaves Reed to experiment on Lockjaw, flying off on his own to try an alternate means of freeing the Inhumans. He flies out to a remote desert to see if he can burn to peak intensity. He burns hotter and hotter, but his flame is snuffed out by what appears to be a random tornado. No, it’s not a tornado, it’s the original Torch. He announces that he’s there to kill Johnny. The fight scene that happens next is pretty spectacular. Sure, the two guys are both fireproof, which negates each other’s powers, but it’s still great to see all kinds of explosive flame effects in each panel as they duke it out for several pages. The fight ends up underground, where the fires hit a patch of natural gas, causing a massive explosion. Elsewhere, the explosion shorts out the Thinker’s monitoring devices, and now he can no longer watch the battle. Here’s where things get kooky. The Thinker walks over to a big machine and declares, “Quasimodo!” A disfigured face appears on the machine’s screen, and says, “I could serve you better than he!” The Thinker clearly has great disdain for this… machine? Creature? Quasimodo wants a human body, but the Thinker refuses, saying it was a mistake even to give Quasimodo a face and a name. Originally, he was just a “Quasi-motivational Destruct Organ.” The Thinker demands that Quasimodo stop thinking of itself as a person, but poor Quasimodo can’t help it, saying he can reason and feel, and that he longs for the freedom of movement. 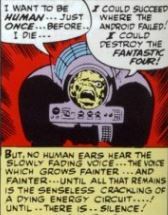 The Thinker won’t have any of that, and he zaps Quasimodo with a “discipline ray.” He then says that if the original Human Torch fails in his mission, Quasimodo must kill the android with the “destruct switch,” and Quasimodo is forced to obey. Back in the desert, more fighting! While the Torches duke it out, the original Torch has a crisis of conscience, wondering if he should take Johnny captive instead of killing. He reveals to Johnny that he’s working for the Thinker. Johnny argues that they have a common enemy and should be working together. The destruct switch activates (what else?) a destruct beam. The original Torch puts himself between it and the others, sacrificing his life to save theirs. “Men may have called him an android, but he died as human as any,” Reed says. The Mad Thinker escapes in an “aqua chamber.” (I guess this secret lair of his is underwater). Then Lockjaw prepares to teleport again, and Johnny takes this as his cue to whine about Crystal some more. Johnny and Wyatt teleport away, and Reed lets them go, saying Johnny will be all right. In another room, all alone, Quasimodo appears to be dying, saying his circuits are fading and that he wants to know what it’s like to be human, if even for just a moment. Then, as the lights fade, he also swears revenge against the Fantastic Four. Fade out: While answering fan mail, Reed jokes that at least they letter aren’t bills, and Sue responds that more bills are on their way because she recently went shopping. She also serving the guys tea as she says this. Feminism! Clobberin’ time: Ben is reduced to comic relief in this one, basically standing around in the background being sarcastic while everyone else does all the fighting. Flame on: Johnny proves he can throw punches as well as fireballs, as the fight against the original Torch goes into hand-to-hand combat. He’s also able to appeal to the original’s better nature. Trivia time: The original Human Torch debuted way back in 1939, as Marvel (then called Timely Comics) desperately tried to come up with hero characters to compete with DC’s mega-popular Superman. The Human Torch and Captain America were two more successful attempts, with others like the Blue Blaze, Dynamic Man, and the unfortunately-named Flexo the Rubber-Man faring not as well. Once reintroduced to the Marvel Universe, the original Torch came back, became involved in the origins of both the Vision and Ultron, and later joined the West Coast Avengers. Behind the scenes, the story goes that the creator of the original Human Torch, Carl Burgos, wanted to get the copyright to the character back. Marvel prevented that by using the character in this issue, reestablishing the Torch as a Marvel property. According to legend, Burgos later burned all of his Marvel comics in protest, and in front of his daughter no less. Quasimodo would later get a body, and he’ll mostly appear in outer space-type stories, fighting the Silver Surfer, Captain Marvel, and Rom the SpaceKnight. If this story seems a little too short for a stormtrooper an annual, that’s because when originally published, the second half of the comic was a reprint of Fantastic Four #25, which you’ll remember was that great Thing/Hulk fight. Fantastic or frightful? The Torch vs. Torch fight is more awesome Jack Kirby action, and the interaction between the Mad Thinker and Quasimodo is wonderfully quirky. Beyond that, though, this one’s a little thin on plot. The drama picks up in a big way next issue. Next week: Sand and surf!